Some say that dogs and cats can’t be best friends — but Morticia and Gomez managed to convince an entire stadium of people otherwise, in just one day. 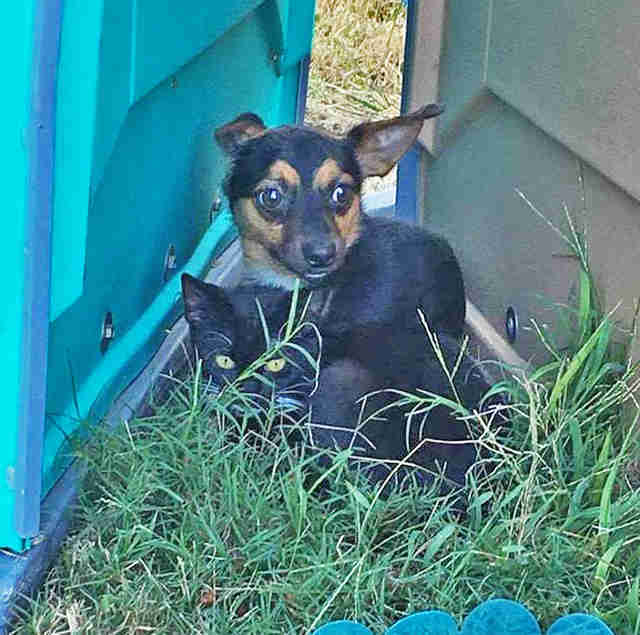 Earlier this week, a Good Samaritan spotted a small dog and a little black kitten huddled together between two portable toilets at Hampton Soccer Park, in Hampton, Virginia. The passerby decided to bring attention to the unusual pair, posting their whereabouts on the private social network Nextdoor. A few animal lovers rushed to the soccer complex, and sure enough, found the bonded pair still cowering in the grass, frozen in place. Getting the two to safety, however, wouldn’t be as easy as they thought. 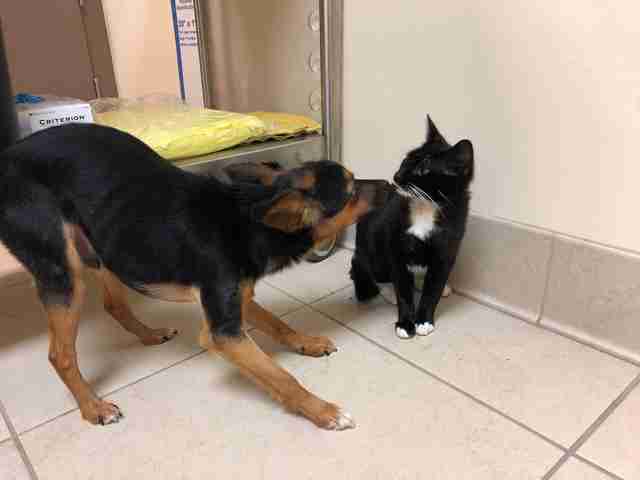 Gomez, a 2-year-old Chihuahua, insisted on protecting the tiny kitten at any cost. The two were eventually brought to a local shelter, and given time for their owner to come forward. 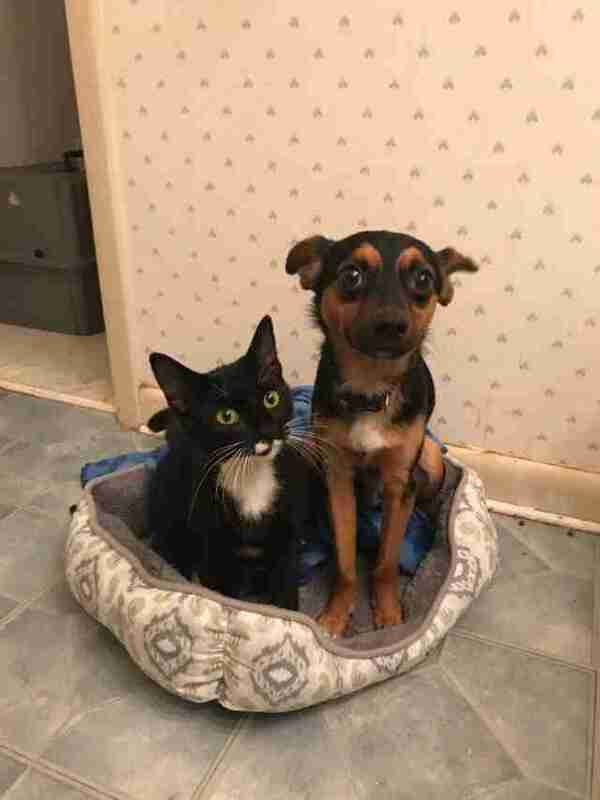 A photo of the pair was shared on the Facebook group Lost & Found Pets of Hampton Roads, VA, where the post made Turkan Ertugrul, director of Saver of Souls Pet Rescue, stop everything she was doing. Ertugrul couldn’t get the bonded animals out of her mind, especially since she knew they would most likely be kept apart at the shelter. Ertugrul knew there was more to just physical safety with animals who are bonded — psychological health is important, too. 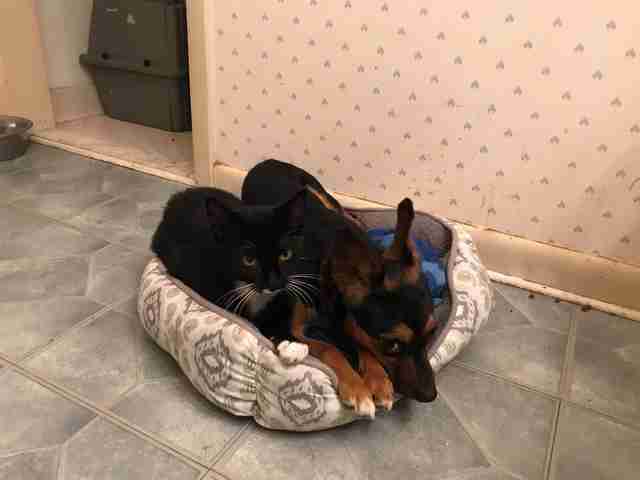 And even worse, she knew the shelter wouldn’t be able to ensure that the 10-month-old kitten and her protective pup would go to the same home. So she decided to make room for the pair as soon as they could be released and find them a home together. Luckily for Gomez and Morticia, shelter workers didn’t want to separate the pair either, and organized playdates for the interspecies couple in a meeting room where they were always happy to see each other. Now happily living together in a foster home, it’s clear just how deep the animals’ bond goes. “[Gomez] ran up to the foster’s black cats initially, thinking one was Morticia and you could see his disappointment when he realized it wasn’t her,” Ertugrul said. Once the two have been spayed and neutered, they will start the search for a home that will keep them together forever. And it’s clear nothing in this world would make them happier. If you live in the Hampton Roads, Virginia, area and are interested in adopting the bonded pair, you can contact Saver of Souls Pet Rescue.